A bicycle should be fit based on two primary considerations: the physiology of the rider, and the demands of the event. The physiology of the rider may include the smoothness of the pedal stroke, the joint angles at which effective force can be delivered, and ability to bend at the hip without compromising the lumbar spine. 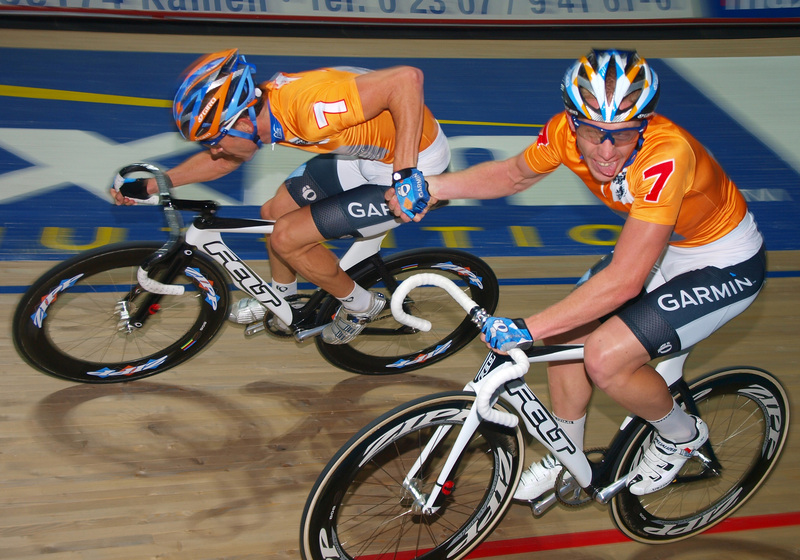 In the case of track cycling, the demands of the event include: a broad range of cadence demands (from standing starts and low speed accelerations in a big gear, to sustained high cadences during a team pursuit and high speed sprints in a points race or keirin), an aerodynamic rider position, high power output (both sustained and in short durations, frequently with short recovery), precise weight distribution over the axles for high speed maneuvering. Track races have higher average speeds than most road events, so in some cases it may make sense to place the rider in a more aerodynamic position on the track bike. Proper saddle setback, which puts as much weight as possible on the saddle given the mass distribution of the rider, the limb and torso length, limitations lower back and hamstring mobility, flexibility and ability to generate symmetrical force while in a position of acute hip flexion. Proper bar height and extension which is set according to the mass distribution of the rider, the limb and torso length, limitations lower back and hamstring mobility, flexibility and ability to generate symmetrical force while in a position of acute hip flexion, and is set within context of the demands of the event the bike is being fit for (for example, longer road rides with lots of vertical gain vs. shorter, faster group rides). Proper saddle height set within the parameters of pelvic stability and pedaling technique. Proper arch support, foot correction and cleat position. Bar height: may be lower (1-3cm) reach than road bars. This depends on the context of the road position. If the rider is already very aggressive on the road bike, no change may be necessary. If a rider is at their functional limit on their road bike, no change may be possible. When a rider shows a high level of function, a good baseline is to place bar height so the torso is horizontal with a slight bend in the elbows when in the drops. This allows for a slight relief of the torso angle (perhaps 5 or 10 degrees) with the arms straight. Stem length: may be shorter, the same or longer depending on the style of the rider. Some athletes tend to “curl” the spine under maximal loads at very high cadences. While this is not ideal form, it may be very difficult to change this habit under maximal load and as a result, the bars may “get too far away” during sprints. This may be particularly true for a rider who uses an old school “flat/dome” style saddle (such as a Flite, Rolls, or Arione) and who comes forward towards the tip of the saddle under high load. For riders who are more anchored in the saddle, ride with a more extended spine and have a more complete pedal stroke, a longer reach may work better. This is because as the athlete sprints through turns, they will have the sensation that the bars are coming towards them, as a result of the centrifugal force of the turn compressing the athlete. In some cases, trial and error on the velodrome may need to be the final determining factor in stem length. This cannot be simulated on any trainer or fit bike. Handlebar width: may be the same as road, or 1 size (~2cm) narrower. Many riders find that the increased clearance provided by narrower bars gives a window of safety they appreciate when in a peloton. A narrower bar is more aerodynamic, but gives the rider a reduced point of leverage to pull from during standing accelerations and standing starts. Most riders find the narrower width to be acceptable on the track, even though there are moments when it is necessary to apply a lot of force to the bars at low speed, in a very big gear. One product in particular, the 3T Scatto track bars, come in very narrow 350mm and 370mm widths. Many riders find these bars work well for sprinting and some even use them for points racing and other mass start events. They are not advised for madison racing, as the tops flare forward from the stem, which does not allow for a stable platform from which to throw in a rider during exchanges. Pedal stance: many track riders use road pedals or modified road pedals on the track (clipless pedals with an added toe strap) so in most cases, pedal stance ends up being 9-12mm narrower than on the road, due to the fact that most track cranks have a narrower pedal separation distance than most road cranks. The typical PSD (or Q factor) for track cranks is 136-140mm. Most road cranks are in the range of 148-152mm. Many riders tolerate a narrower stance quite well, but this may be more of an accident than by design; if the rider is prone towards symptoms of “medial collapse” (IE one or both knees hitting the top tube, or one or both feet showing signs of pronation) then moving the feet closer together will help alleviate these poor movement mechanics without educating the rider of the root cause. For riders who would do better on a wider stance, riding a track bike may be problematic and could require some creative equipment selection. The simplest choice may be a pedal system with longer axles (both Shimano and Speedplay currently offer these options). Saddle setback: setback can be the same as road or slightly more forward, depending on if bar height changes. As the bars come lower, the hip angle will become more acute (all other factors being equal) so if the goal is to maintain hip angle between bikes, the saddle could come forward to accomplish this. Another way to achieve the same goal could be to use shorter cranks on the track bike. Moving the saddle forward comes at the potential compromise of posterior chain muscle recruitment and support of the torso by the saddle. As the saddle moves over the bottom bracket, there is usually more reliance on quads to drive the pedals and more postural muscles will be recruited to support the weight of the thorax. Saddle height: normally this would be the same as the road bike, but adjusted for different length cranks. This means if your track cranks are 2.5mm shorter than your road cranks, your saddle will be 2.5mm higher on the track bike in order to maintain leg extension at the bottom of the stroke. This is most easily accomplished with the exact same saddle on both bikes. If different saddles are used on the bikes, accounting for the compression of padding and base materials, and different base shapes can get quite complicated and amounts to a pile of guesswork as there is no easy or reliable way to quantify these factors. For a rider who wants to precisely control variables, identical saddles are the first choice. Another factor to consider in track bike set up is weight distribution relative to the axles and the bottom bracket. Track bikes are different in that when the rider is cornering or changing direction, they are always pedaling (hopefully!). This means that standard handling rules do not apply. A rider does not coast, put the outside foot down, push hard on this foot and simultaneously lean hard on the inside bar to make the bike lean as they would on a road or cyclocross bike. This means the rear wheel potentially has less weight to “anchor it” during quick changes in direction. Skipping a tire during an abrupt change in direction on the track can be disastrous, so we work to avoid these scenarios. In particular, during madison exchanges if the rear wheel is not weighted properly, the bike can become unstable which leads to powerless exchanges or in the worst case, a tumble. It is somewhat common for a rider to ride with their saddle more forward than optimal on the track. Because the fixed gear “assists” the rider through the dead spot (from 10 o’clock to 12 o’clock), many times an athlete can have pretty poor technique and not really be aware of it. If the saddle is too far forward on a road bike, when a steep climb begins the rider will feel loaded quads and a magnified dead spot. The decreased inertia and slower cadence will magnify the poor technique and it will be easy to diagnose the problem. This is camouflaged, to a degree, by a fixed gear bike and the fact that there are no climbs on a velodrome.